A diptych was originally a hinged writing tablet. The two halves folded together and closed to protect the waxed writing surface. From there, it became a term used to define artwork of two folded sections and later simply art made of two matching parts. Today, the term diptych is used for a juxtaposition of two photographs that tell a story together. 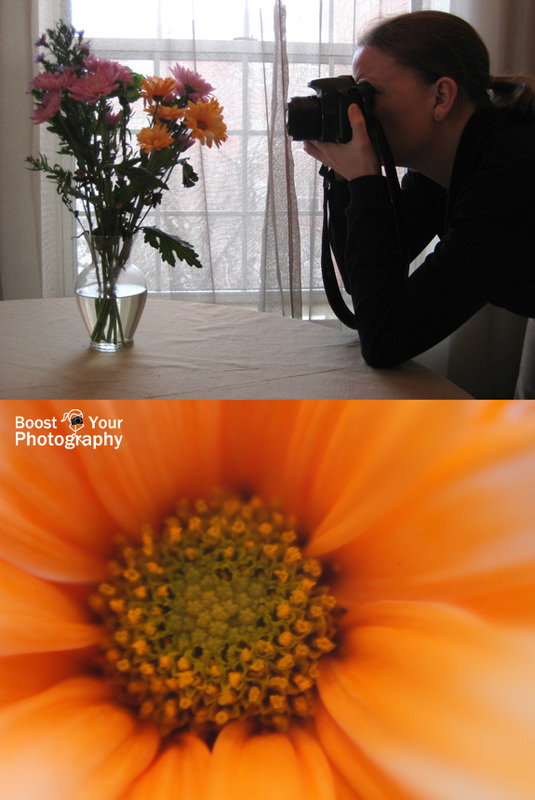 Creating a diptych is this week's challenge for the Boost Your Photography: 52 Weeks Challenge. There are many, many ways that photographers have used the diptych technique. Some of the most common ideas for diptyches include before-and-after, compare-and-contrast, detail-and-the-whole, and unexpected. 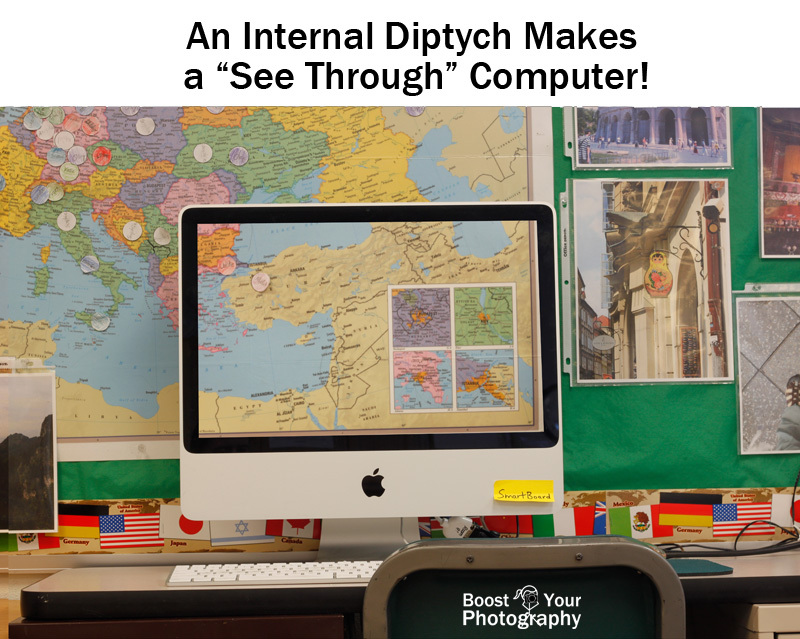 Searching for the term 'diptych' on Google or Flickr will give you many more ideas too. Highlighting the differences in a before-and-after pairing is a popular reason for a diptych. Most before-and-afters are presented in symmetrical fashion, with both photographs the same size and displaying the exact same portion of a scene or subject. Here, the story comes from the differences between the two photographs and the amount of time or effort that has passed between them. Read the full article for details and tips for shooting a before-and-after series: Better Before and Afters. 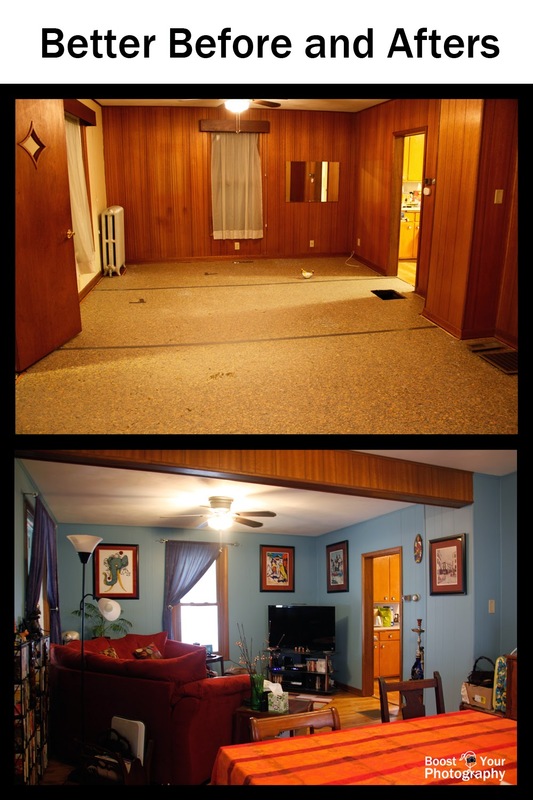 This 'internal' type of before-and-after diptych was popularized by the web site Dear Photograph. By lining up a older photograph in its original location, you can present a story of then-and-now in a powerful way. In this diptych above, it is amazing to me to see how massive the trees became in the twenty years between when these photographs were taken. Read more details about how to accomplish this type of shot in the article Rephotography: Dear Photograph. 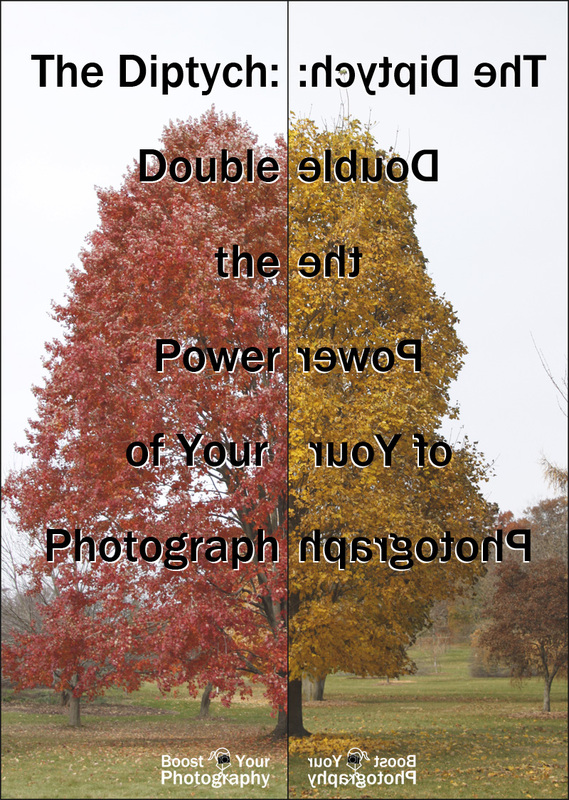 You can also create a diptych by combining two images that compare and contrast with each other in an interesting way. In the diptych above, I had been having the nagging feeling that spring was coming quite late, and checking back through my photographs from the year before confirmed it. 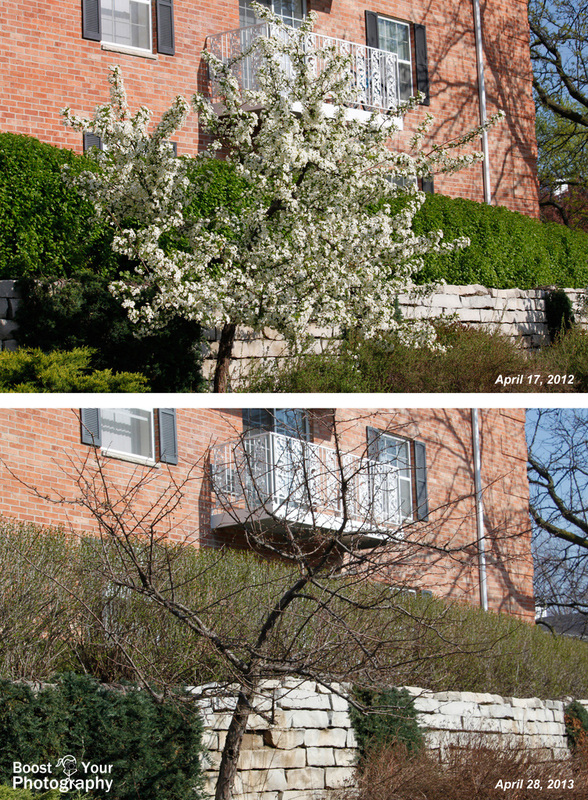 I went out and re-shot the same crab apple tree a year later to showcase the major differences in seasonal timings between the two years. Another common structure for a diptych is to showcase a detail about the subject as well as a more complete view of the whole. The detail shot is therefore given context and perhaps made more recognizable. With the diptych above, I combined two shots that were taken at the same time - the wide view of me taking the macro photograph of the flower, below. 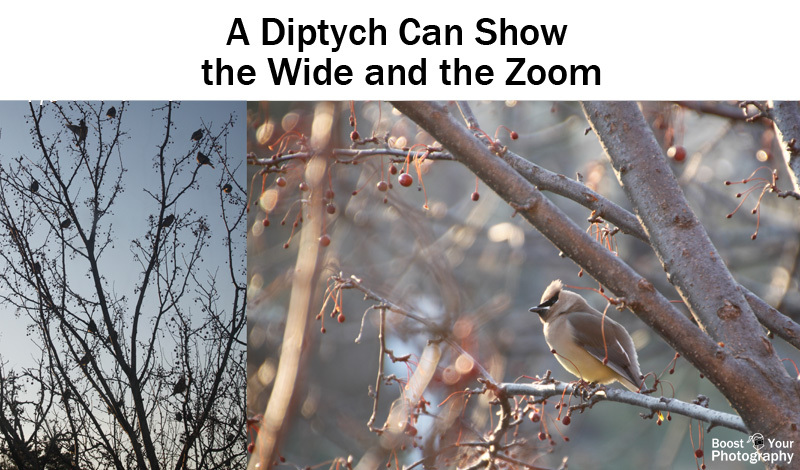 With this diptych, I wanted to show both the whole mass of Bohemian waxwings that were gathered in the tree as well as the details of an individual bird. The part and the whole. If you are really looking for a photographic challenge, there are whole subsets of diptyches that feature unusual or unexpected combinations of photographs. Think above and below the water line or behind both sides of a door. Some even include M. C. Escher-inspired interactions between the two images. If you are at all handy with Photoshop, this is quite a fun rabbit hole to descend. The diptych above was my first attempt at such a challenge. The left-hand photograph came from the set of a play that my students were doing. 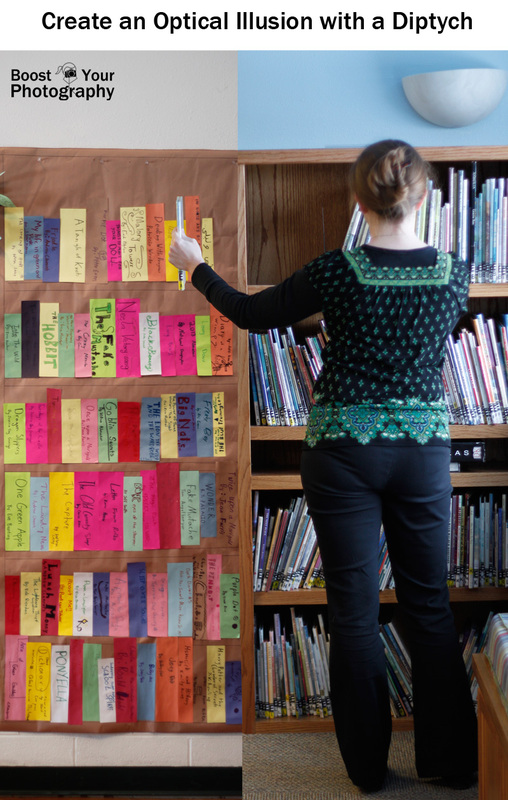 We had created a paper book shelf, and each student added their own favorite books and book titles. The right-hand photograph was cropped down from a wider shot where I was pulling a book off a shelf in front of a blank wall (next to the actual bookshelf that appears in the final diptych). A short time with masking in Photoshop allowed me to add my arm and real book to appear to be pulling it off the paper bookshelf. A diptych is a great way to spark your creativity and have a little fun. 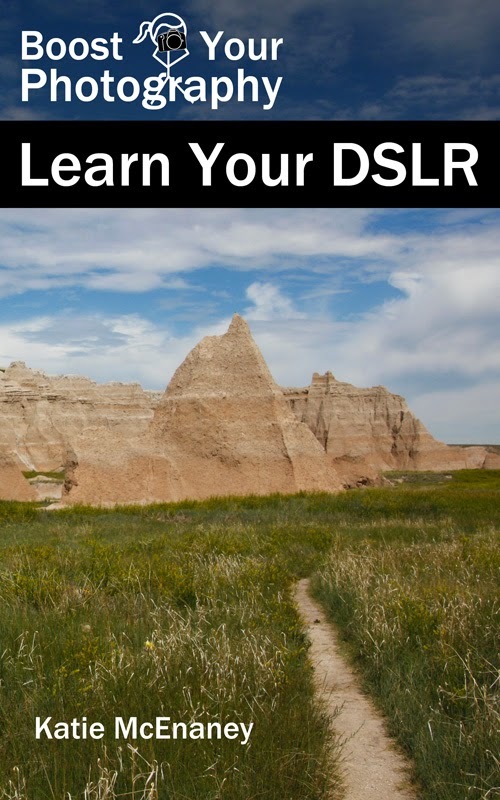 Take a series of shots and try pairing them in different ways. Or dig out some old photographs and try a before-and-after or rephotography challenge. Whatever you decide, share your results with us! 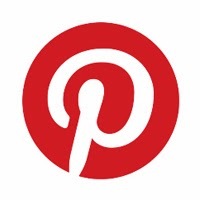 You can share a link or a photograph in the comments below, or consider joining the BYP 52 Weeks Google+ Community to share your weekly photograph and see what others are capturing.